Surface modification of biomaterials can ultimately determine whether a material is accepted or rejected from the human body, and a responsive surface can further make the material "smart" and "intelligent". 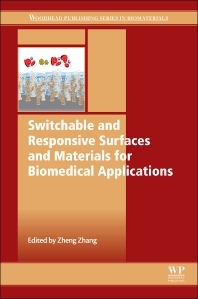 Switchable and Responsive Surfaces and Materials for Biomedical Applications outlines synthetic and biological materials that are responsive under different stimuli, their surface design and modification techniques, and applicability in regenerative medicine/tissue engineering, drug delivery, medical devices, and biomedical diagnostics. Part one provides a detailed overview of switchable and responsive materials and surfaces, exploring thermo-responsive polymers, environmentally responsive polyelectrolytes and zwitterionic polymers, as well as peptide-based and photonic sensitive switchable materials. Further chapters include a detailed overview of the preparation and analysis of switchable polymer brushes and copolymers for biomedical application. Part two explores the biological interactions and biomedical applications of switchable surfaces, where expert analysis is provided on the interaction of switchable surfaces with proteins and cells. The interaction of stimuli-sensitive polymers for tissue engineering and drug delivery with biosurfaces is critiqued, whilst the editor provides a skillful study into the application of responsive polymers in implantable medical devices and biosensors.